Henry Cyr and the Ensemble of Jekyll and Hyde. Photo provided by Third Wall Productions. “Jekyll and Hyde, The Musical” ranks among the creepiest of Broadway musicals. Even the upbeat numbers are downers. And yet, it is a surprisingly entertaining piece of theatre. For the most part, Third Wall Productions current show manages to convey the creepy and the entertaining – although not always at the same time. With music by Frank Wildhorn, a book by Leslie Bricusse and lyrics by Wildhorn, Bricusse and Steve Cuden. Jekyll and Hyde opened on Broadway in 1997 and ran for more than 1500 performances, even though it lost money and was not a critical favorite. It tells the familiar tale of Dr. Jekyll and his weird self-experiments to isolate the evil in mankind from the good, splitting himself into the murderous Mr. Hyde. Spoiler: It doesn’t end well for either of them. Director Lance Bankerd has made some very interesting choices in his approach to the material, with varying degrees of success. His use of special effects is always well chosen and appropriate and sometimes downright inspired. He keeps the action moving quickly and manages to get the large cast on the smallish stage with impressive aptitude. Bankerd uses the ensemble as kind of a Greek chorus during each of the murders committed on stage, their leering, toothy faces serving as a backdrop to the crimes. It’s creepy and not a choice I’ve ever seen in other stagings of the musical, but hey – if that’s what he wanted then the cast did him proud. It was just kind of weird and distracting to me. But his decision to have Jekyll/Hyde walk eerily up the long, center aisle of the space under a spotlight, while the two female love interests sing “In His Eyes” was brilliant. An obviously talented craftsman, Bankerd knows what he wants and is very skillful and adept at getting it. The challenge of staging a musical in a church is that there is no stage to speak of unless you’re lucky enough to have inventive set designer/builders like Jordan and Jennifer Hollett and Pat Rudai. They have added upper levels on both sides of the altar and added an elaborate backdrop curtain that hides Dr. Jekyll’s impressive secret laboratory, complete with bubbling potions. Jim Shomo’s creative lighting design works well though the cast will hopefully get better at staying in the lighted areas, particularly during solo numbers. Amy Rudai and Marie Bank do a bang-up job with the costumes and Charles Hersch will iron out the sound issues with a couple more runs under his belt. Andrew Zile is both the Music Director and conductor and does a fine job with both, coaching the cast and the orchestra with equal dexterity. The ensemble is made up of some exceptional singers who handle the challenging score quite nicely. Standouts in the supporting cast are J Purnell Hargrove as Dr. Jekyll’s best friend Gabriel John Utterson, and Michael Zellhoffer as Sir Danvers Carew. Roni Mosco is a knockout as Lucy Harris. With a voice as brassy and big as all get-out, she struts the stage with confidence. She is calm and focused and will bring a tear to your eye with the longing in her voice when she sings “Someone Like You.” I would have appreciated her to be directed to have a little more sass in ‘Bring On the Men.’ You can get a lot of mileage out of a well-cocked hip or a lowered eyelid. And I’ve probably heard voices as good as Andrea Minino as Emma Carew, but I’ll be danged if I can recall one lately. She’s as pretty as a bowl full of ripe peaches on a summer day and has a voice that is as fine as spun sugar until she lets loose a belt note that can make the hair stand up on the back of your neck. Minino plays Emma as a strong woman who is fiercely devoted to her guy, with none of the simpering Victorian Lady so usually seen in period pieces. Henry Cyr is an attractive Dr. Jekyll, scary as Mr. Hyde, and navigates between the two roles well. While he is a little young for such weighty roles, he nevertheless is more often than not convincing. His voice is strong and sure and his delivery in “Alive” is riveting. He’s good-looking, he can sing like a pro and is quite the accomplished actor. When he sings “Confrontation,” the duet Jekyll does with Hyde (you have to see it to understand it), he whips himself into a veritable frenzy that is exciting and disturbing and spot-on. 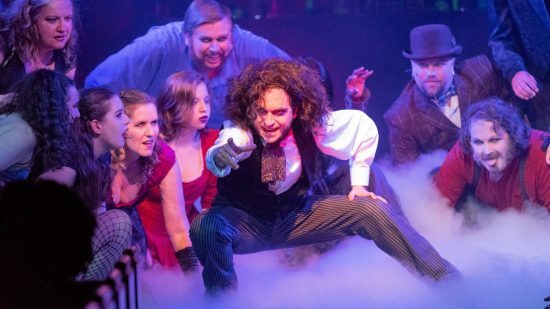 So go see “Jekyll and Hyde.” Third Wall Productions has turned in another well-conceived show with excellent direction, polished leads, a chorus that sings their scary heart out, all on a stage that shows just what a little imagination can do in the right hands. It’s worth the ticket. And deserves to be seen. And remember – don’t try these kinds of experiments at home. No good will come of it. “Jekyll and Hyde” runs through May 20, 2018 at 1108 Providence Road, Towson Maryland 21286. For tickets and information, click here.